A few years ago I posted what I would call a review of the series School Rumble. Since then, I have ingested several more titles and have had more experience in different types of anime, particularly comedy. 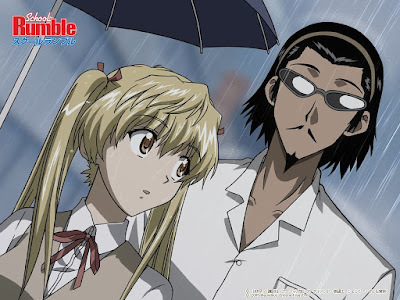 So I decided a good way to spend this animeversary is to do a review of the first season of School Rumble. Now I am not sure if I should call this a "re-review" or a "second opinion" or what, but I will at least be adapting the new anime review style I have begun on here. So here is the series that got me into anime, and a series that holds close to my heart. 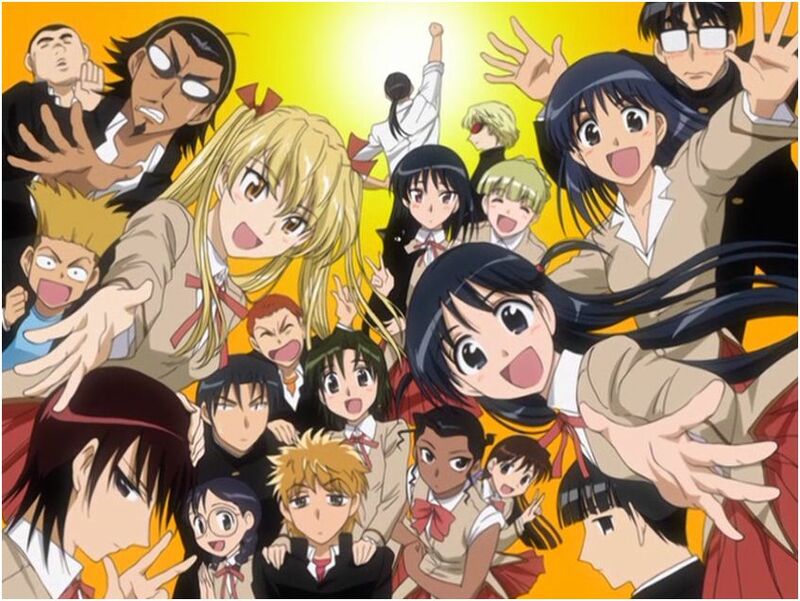 This is...School Rumble! Yeah...there are a lot of characters in this series, but it isn't too overwhelming. School Rumble is a series that was written by Jin Kobayashi and animated by Studio Comet. The series follows a love triangle between the ditzy, but happily energetic Tenma Tsukamato, the harsh, but sensitive delinquent Kenji Harima, and the strange Oji Karasuma. Tenma loves Karasuma, Karasuma seems oblivious to Tenma's attraction to him, and Harima is in love with Tenma, while Tenma is oblivious to his attraction to her. Yes, this is the focal point of the series, more or less. When the series first starts out, it seems as if the major focus is on Tenma, as most of the first few episodes are dedicated towards her advances of Karasuma, but the series actually shifts more focus on Harima later on. The main storyline is basically their failing to make the one they love notice them. Sometimes it is in the form of being unable to say "I love you" to elaborate schemes that somehow mess up in the end. Now if the series was just this, then it wouldn't be much of a series to watch. The rest is focused on the rest of the high school's class 2-C. The class is made up of all kinds of characters who are either endearing, or downright annoying. The series focuses more on Eri Sawachika, Makoto Suo, Haruki Hanai, and Tenma's younger sister Yakumo. Together, they get involved in all kinds of misadventures that make up a typical high school career. The other people in the class get some exposure as well, but they may be relegated to a portion or just a section here or there instead of several episodes. The main game of the series, though, is relationships. Whether its friendship, unrequited love, or something entirely different, there is no doubt that the series focuses on not only the relationships, but the characters within these relationships. 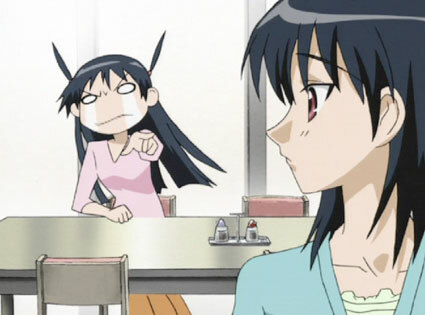 Now don't get me wrong, School Rumble is not a teen/high school soap opera. It is mostly a comedy. I know my description of it so far doesn't point to that, but it really is a comedy show with romantic elements put in here or there. Every relationship is pushed to the hilt in this series. The original love triangle seems to be basic enough, but all the options are stretched as far as they can go and is done quite well. Another element would be the slice-of-life stories. Like the picture above this paragraph, sometimes the series looks into the sweeter or more pure aspects of life. It makes me wish I was a younger guy again...sometimes. I don't want to spoil the series for you, but characters will get involved with other character's lives. Several girls get ambiguous with one of the male characters, male characters will chase after one girl, and so on. They become more interconnected the further the series progresses and these cause a lot of misunderstandings that are both hilarious and more plot driven. Again, this is done quite well, but sometimes reality is stretched a bit, especially towards the end. There are a lot of other things that could be mentioned, like Harima's new found comfort in manga drawing, rivalries between classes, and character growth, but that would make this already long review even longer. It is better just to experience it for yourself instead of reading about it. Visually, the series is hit and miss. After seeing other pleasing series, like Eden of the East, Death Note, Spice and Wolf, and so on, this series does falter a bit in that department. The animation is very simplistic, sometimes minimalistic when it can be. It does have its moments, but sometimes there are problems with quality. I remember one episode where a character walks and I thought "WHOA! Real animation! ", which is kind of sad. This isn't a series known for its animation. I do enjoy the character styles, but the animation usually leaves some to be desired. The music of the series is hit and miss as well. I didn't care for either the opening or ending themes of the show (The second series, on the other hand, I loved), but the background music I found catchy. Unfortunately the background music also sounds very MIDI-esque, meaning that it is very simple and not high quality. Though to this day, I get some of the music stuck in my head from time to time. Yes, I promise Tenma is the older one, she just doesn't act like it. The characters are hit and miss as well. Some of them are done quite well, like Yakumo, Harima, and Eri, while others may grate on your nerves, like Imadori, Karen, or anyone from Class 2-D. Sometimes you may question why some of the characters were even needed. True, some may have been added to make the series stretch out longer, but it really seems unnecessary. The second series goes more in to detail on the minor characters, but that is a different review for a different time. The voice acting is done really well and includes many of the Funimation staples. This is the series that made me appreciate Luci Christian as a voice actress as well as others like Leah Clark, Eric Vale, Brandon Potter, Chris Cason, and Brina Palencia. They certainly did a great job with the dub and as my first anime in forever, made me feel comfortable watching it. Funimation has released this series several different times. First the series was released in volume format. After that, they released a "complete first season" box set with extras. Then they released a "Viridian Collection" which included the box set as well as the 2 episode OVA. Finally, they bundled the first series with the second and made one big collection. So I think I've done enough reviewing for the series. Let's go to the series gradecard and see how it stacks up, shall we? Characters: B- - The series has a mix of good characters and bad characters, though most of them are put to good use, whether it is in this series or the next one. Story: A - The story of the series is just wonderful to even think about. It is a lot of fun to watch, but it isn't over the top like some series are. It balances between the comedy and drama very well. Animation - C - The animation isn't the strong point of the series. It isn't anything to write about and while the character designs are good, the animation itself isn't the best. Music - B - The music, while not in my personal taste, is catchy and while it isn't high definition, it does provide a good tone for the series overall. Release (Extras) - A - Funimation did a great job with the first series release. They included not only the episodes, but eventually added the OVA episodes, interviews, promos, and so forth. They put more effort in to this series then they have with most. Rewatchability - A - A highlight of the series is just to rewatch it. You will get lost during your first viewing, I'm sure, but repeated viewings not only make you pay attention to the story, but also see how the author knew what he was doing all along (well, except for the controversial ending). Overall grade: A- - Yes, this series really does not rank higher than some other I have seen, but it will still continue to be a personal favorite of mine for quite a while. I enjoy rewatching the series from time to time and it is still a blast to me, even if it isn't to par with more modern anime titles.